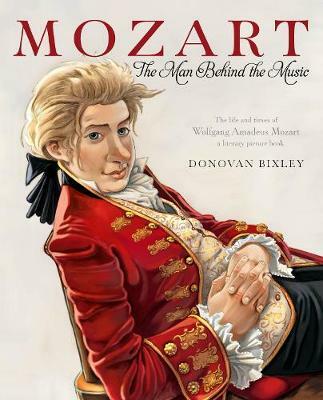 In this charming and very personal tribute, artist Donovan Bixley offers a portrait of Mozart that will forever change the way he is viewed. In nearly 100 original drawings and paintings, Bixley brings Mozart to life with humour but also reflects the turmoil of the times in which... read full description below. Child prodigy, genius, freak, a man who lived frivolously and died a pauper... The myths surrounding Mozart, composer of some of the world's most sublime music, have long overtaken the known facts of his life. Now, in this charming and very personal tribute, artist Donovan Bixley offers a portrait of the composer that will forever change the way he is viewed. In nearly 100 original drawings and paintings, accompanied by text based on the many letters that he wrote during his life, beginning with the delightful, if misspelt, letters he wrote as a thirteen-year-old boy travelling in Italy with his father. Like his successful Much Ado About Shakespeare , Bixley brings Mozart to life with humour but also reflects the turmoil of the times in which he lived. This is a newly rendered version of the book successfully published in 2006. Donovan Bixley was a finalist in the Montana New Zealand Book Awards for Faithfully Mozart in 2006. He has written and/or illustrated over 70 books, including the international hit Dinosaur Rescue series (with award-winning author Kyle Mewburn, published in 13 countries).